Heat vegetable oil in a wok over medium heat. When the oil starts to turn hot, add green curry paste and stir-fry until the green curry paste is cooked (about 1-2 mins). Add coconut milk into the wok and stir until the mixture is well combined and the coconut milk is boiled. Add chicken slices, fish sauce, sugar, green peas and sliced red chillies into the wok and stir well. Add 1 cup of cooked rice into the wok. Stir-fry until the rice absorb the green curry. 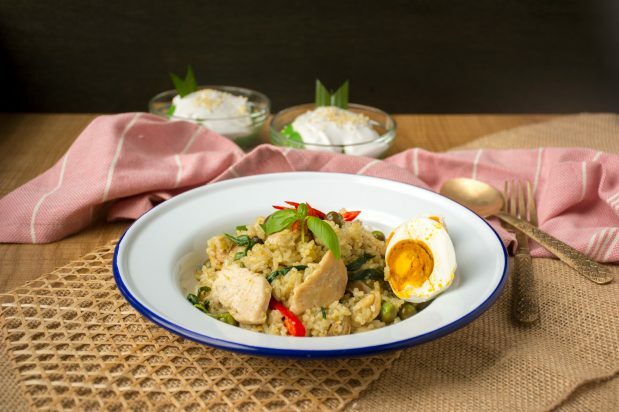 Transfer the green curry fried rice to the serving plate. Garnish the dish with basil leaves, sliced chillies and salted egg. Serve.